China has a huge fishing fleet, one that scours domestic and international waters to catch enormous hauls. Indeed, the statistics speak for themselves. For example, of 4.6 million fishing vessels worldwide, 3.5 million are in Asia and China fields 1.07 million of them, according to 2014 figures. Of these Chinese boats, 686,766 are motorized. Possessing 23.16% of the world's fishing boat fleet, it is unsurprising that China is the largest harvester of fish, followed in order by Indonesia, the USA, Russia, Japan, Peru, India, Vietnam, Myanmar, Norway, Chile and the Philippines, according to Food and Agriculture Organization (FAO) statistics released in 2016 but covering the year 2014. After clamping down on fishing in its own waters because stocks have become seriously depleted, China has expanded its long-distance fishing fleet. Chinese boats accounted for 17 million of the 40 million fishing hours performed by large ships worldwide in 2016. In doing so, the country outranked the hours of the ten next biggest countries combined. China only began controlling its number of fishing boats in 1987. It has promised to cap its long-distance fleet at 2,000 vessels by 2020, a figure that is about 100 boats more than it currently possesses. Yet China's fleet is only economically viable due to generous state subsidies, which amounted to USD418 million in 2014, even though the Japanese and Spanish governments spent even more on subsidies to national fisheries. Interestingly, governments globally spent USD4.2 billion on subsidies for high-seas fishing in 2014, an amount that exceeded the profits actually made from the activity, according to a recent report by the journal Science Advances. That year, some 4.4 million tons of fish were caught on the high seas, of which China was responsible for 1.5 million tons. The report said, "Without subsidies, high-seas fishing at the global scale that we currently witness would be unlikely. On aggregate, current high-seas fishing by vessels from China, Taiwan and Russia would not be profitable without subsidies." Yet China plans to increase its annual high-seas catch to 2.3 million tons by 2020. The country's far-ranging fishing boats have clashed with coast guards in countries as far away as Argentina, Ecuador, Guinea and Indonesia. Could these greater goals and targets end up in more illegal fishing? There is no doubt, however, that China is attempting to tighten up this area. Speaking at a symposium about China's fishing industry that was organized by the Hong Kong-based French Centre for Research on Contemporary China (CEFC) on 7-8 June, Wang Xuefeng of Guangdong Ocean University in Zhanjiang explained that boats less than 12 meters long have received fewer subsidies since 2012, and boats older than 25 years will receive no subsidies after this year. In 2002 the government introduced a buyback scheme to encourage fishermen to decommission their old boats. Since 2006, China has offered fishermen a fuel subsidy. The government offers a tax refund to fishing boat owners for fuel used, just as it also does to forestry companies operating trucks mostly off-road, and to operators of shuttle buses in remote rural areas. Michael Morin, an associate researcher at the Centre de Droit Maritime et Oceanique in France, pointed out at the CEFC seminar, "Subsidies encourage overcapacity, increase the pressure of fishing on stocks, which may result in illegal fishing." The government recognizes that these fuel subsidies need to be reduced, so it has begun reducing the amount about 12% per year. Indeed, by the end of 2018, the fuel subsidy should be only 40% of what it was in 2014, Wang noted. To help promote sustainable fishing, the government will move subsidies to other areas such as fishery restocking, habitat restoration and allowances to help fishermen find jobs in alternative industries. In 2003, China introduced a policy encouraging fishermen to change their profession. However, Wang pointed out four challenges for the Chinese government in managing its myriad fishing vessels. The first is that, while fishing methods changed, its management systems were not modernized to keep up. Secondly, it remains difficult for China to manage illegal, unreported and unregulated (IUU) fishing. For example, many boats have no name, no fishing license and no safety certificate. The third problem outlined by Wang is that many fishermen are poorly educated and have low literacy rates, which hinders any updates to fishing management. The final challenge, according to Wang, is difficulties in sharing data between researchers and institutions. This means the government has poor available data on stock levels and catch data, for instance. Wang concluded that "China's fisheries face more complex situations than ever, than any other country". Specifically, the country has innumerable fishermen, surplus fishing capacity, depleted or declining fish stocks, and coastal ecosystems that are malfunctioning. Indeed, China is facing a "fishing down" scenario, where the catch is reducing despite more resources being invested, according to Liang Cui at the Institute of Oceanology at the Chinese Academy of Sciences. Liang said that China has implemented summer fishing moratoria in the East China Sea since 2017. The government has also introduced new regulations banning destructive fishing methods, the minimum mesh size of nets, the minimum catch size of fishing targets, and a proportion limit of undersized fish in the catch. The fact that the government still has poor control over China's massive fishing fleet is seen in the fact that its fishermen have been witnessed running their vessel screws over delicate reefs in the South China Sea to dislodge giant clams, which saves them time and effort. In doing so, they completely destroy reefs. One place where such scars are evident is Scarborough Shoal within the exclusive economic zone (EEZ) of the Philippines. There, about 552 hectares of the inner reef have been destroyed by clam diggers since 2012, the year that China seized the shoal from the Philippines. The Ministry of Agriculture's five-year plan was implemented in 2016. It aims to reduce the number of commercial fishing boats from the 66,000 of 2015 down to 57,000 by 2020. Liang noted with cautious optimism, "There appears to be a stronger commitment towards accountability, compliance, enforcement of regulations, monitoring and transport reporting on China's marine fisheries." China's Ministry of Agriculture is being more robust with lawbreakers. For example, in March this year it canceled the distant water fishing certificate of a Chinese company that had been conducting IUU fishing in West African waters. The ministry also canceled fuel subsidies for vessels belonging to two other major Chinese fishing companies. Since 2016, Beijing has withdrawn approximately USD105 million in subsidies for 264 fishing vessels belonging to 78 Chinese distant-water fishing companies. China has a number of bilateral fishing agreements with various countries, but these are generally quite secretive. Such a lack of transparency about what is and is not permissible also encourages illegal fishing. Nevertheless, Liang concluded her CEFC presentation by saying, "There are serious problems with fishery resources in China. The government is well aware of them and willing to solve them. However, it still has a long way to go." Of course, China is not the only guilty party in terms of IUU fishing. For example, in April 2017, Jakarta announced that it had confiscated and destroyed 317 fishing boats since President Joko Widodo assumed office in 2014. The figure included: 142 from Vietnam, 76 from the Philippines, 49 from Malaysia and just one from China. Another presenter at the CEFC symposium was Sebastien Colin, a French researcher there. He discussed illegal fishing in the Yellow Sea, the maritime area between China's coast and the Korean Peninsula. Colin said Chinese fishermen accounted for 83.3% of the Yellow Sea catch in 2013, demonstrating that this sea "is widely exploited" by China. Illegal fishing is commonplace there too. Indeed, from 2002-11, South Korea seized 4,175 Chinese fishing vessels and 40,068 crewmen. Over the years, a number of clashes have turned violent, turning the Yellow Sea into a "sea of unlawfulness" and a "battlefield". In response to the belligerence of Chinese fishing boats, in October 2016, Seoul permitted the Korea Coast Guard (KCG) to use force and firearms against illegal fishermen. Colin observed, "There is a big challenge because China's fishery policy is facing a dilemma between protecting fishery resources and feeding the growing domestic market." He suggested that the key to resolving the issue of IUU fishing in the Yellow Sea rests with the policies of Beijing and the two Chinese provinces of Liaoning and Shandong. IUU fishing is a serious issue. It is responsible for robbing the oceans of 26 million tons of seafood annually, and it causes losses of USD23 billion per year for victims. Indeed, one in five fish sold globally is the result of IUU fishing. Some 56 million people worldwide are directly employed in the fishing and aquaculture industries. Chinese ships dominate squid fishing, with 50-70% of the squid netted in international waters being caught by China. The government supports the sector by issuing a squid forecast, using data gleaned from satellites and research vessels, allowing captains to find the most lucrative squid stocks. This could be described as another form of subsidy, which gives Chinese squid-men an unfair advantage. Keeping the best squid for the Chinese domestic market, the price of squid has jumped internationally while the quality exported has dropped. As if it is not enough for China's pirate fishermen to illegally fish and to scour stocks in the world's oceans, a number of them are also zealously performing security missions at the behest of the communist government. Fishing boats, shepherded by China Coast Guard (CCG) vessels, regularly perform "sovereign rights" missions to enforce Chinese territorial claims in the East China Sea and South China Sea, for instance. Many fishermen are also members of the China Maritime Militia, an organization that supports the CCG and Chinese navy by supplying information and hassling foreign vessels. 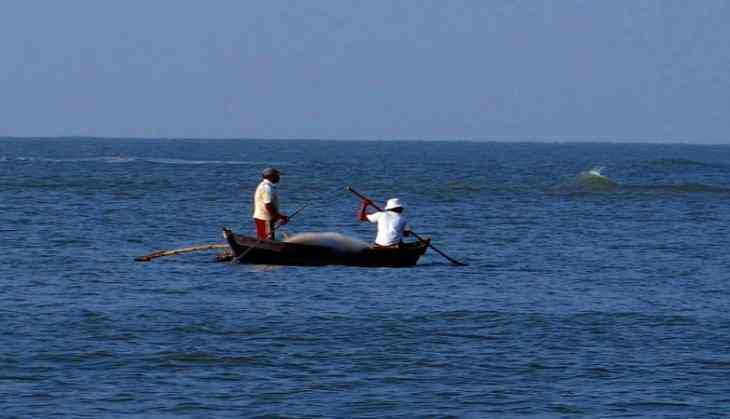 However, such nefarious conduct by Chinese fishermen will remain the subject of a future ANI article.